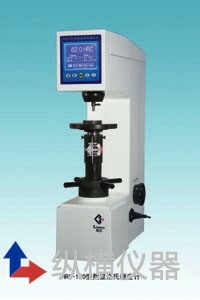 HRS-150 digital Rockwell Hardness Tester adopts novel-designed large LCD screen to display, as well as menu structure. It mainly functions are as follows: 1. Selection of Rockwell hardness scales, 2. Choice of plastics Rockwell scales (special requirement, supply accord to sales contract), 3. Exchange hardness values among hardness scales, 4. Output the results of hardness measurement with printer, 5. RS-232 hyper terminal setting is with good reliability, excellent operation and easy watching. Diamond Rockwell Indenter, Diameter 1.5875mm Hard Alloy Steel Ball Indenter, Large Testing Table , Medium Testing Table and V-shaped Testing Table, HRC 2pcs and HRB Hardness Blocks, RS-232 Interface, Power Cable, etc.